Once you are a qualified skydiver – that is you have completed your AFF course and done your compulsory 10 consolidation jumps to get your Cat 8 certificate (“A licence”) you can skydive at a number of dropzones in the UK for around £20 a jump if you have your own parachute equipment. If you do not have your own equipment you can rent everything you need for around £10 a jump. Most new skydivers buy used equipment from other more experienced skydiver who’s needs within the sport have changed with a gain in their experience. A quality complete used “rig” (this is the term generally a parachute pack – a harness, container, main and reserve parachutes) suitable for a new skydiver can be bought for about £1500 – additionally you will need an altimeter and helmet, both these could be bought used for less than £100. It’s certainly not a cheap hobby, but it’s certainly not expensive either. Once you have all the right gear you can make a skydive for just £18! You will need to maintain membership of the British Parachute Association (“BPA”) each year for £118.60 per annum or the current prevailing membership price. Unless otherwise stated all our AFF course prices include first year membership of the BPA. Although skydiving is a high risk sport when compared to say, snooker or football – and like any fast adventure sport it is of course possible to twist an ankle, hurt yourself in some other way or yes – you could in theory even die, it’s not anywhere near as risky as many people would believe. You can sustain exactly the same injuries in an accident walking across the street, driving to work, horse riding – in fact doing just about anything! Lots of other adventure sports are just as or even more dangerous than skydiving and modern parachute systems and teaching methods are extremely reliable. The average skydiver falls at somewhere between 110 and 130 miles per hour in the “standard” face to earth position. It takes very roughly 10 seconds to fall the first 1,000 feet and then about 5 seconds for every subsequent 1,000 feet – so if an experienced skydiver falls for about 10,000 feet before deploying their parachute they will have had roughly 60 seconds of freefall. Different people fall at slightly different rates because different sizes and shapes of people create more or less air-resistance. As you fall through the air you create air-resistance and have air passing around your body at high speeds. This is referred to in the sport as the “relative wind”. Essentially you feel a great deal of wind as you fall through the air at high speed. A less air-resistant – more aero dynamic shape (such as small person with a pot belly) will generally fall faster than someone with a similar mass – but who is tall with long arms and legs. As you become a more experienced skydiver you will learn how to alter your fall rate by making changes to your body position. By altering your body position you effect your air resistance and subsequently the rate at which you fall. It is a common MYTH that all objects fall at the same rate, this rule only applies in an absolute vacuum, where there is no resistance – here on earth we have air! Anyone over the age of 16 can skydive in the UK, so long as you are fit, healthy and alert. Note that if you are under 18 years old you will need to get parental consent. There are approximately 5,000 active skydivers in the UK from a wide range of social backgrounds, there is a hugely rich social scene associated with the sport, which presents its participants with many opportunities to make friends and travel. If you have any medical conditions you must declare them to us and discuss them with our instructors. Most of our skydives are made from a minimum of 12,000 feet above ground level or higher – normally 13,500 feet. If you wish to make a static line parachute jump, this is normally made from 3,500 to 4,000 feet. If you wish to make more static line jumps you can progress on to higher and higher altitudes. On tandem skydives and AFF skydives your parachute is deployed between 5,000 feet and 6,000 feet. This gives you about 45 seconds of freefall. This deployment altitude is higher than most qualified skydivers would normally deploy and gives plenty of time for a beautiful and enjoyable parachute ride back down to earth. When you are a qualified skydiver you can choose to deploy your parachute at any altitude above about 2,500 feet – although most skydivers deploy at between 3,000 and 3,500 feet. The more you skydive the less scary it becomes and in fact after a few jumps what started off as fear, will probably become nervous apprehension and then nervous excitement! There is no doubt that some people find learning to skydive stressful. In fact most people, especially on their first few jumps find that they are scared to some extent and this is completely and absolutely normal. However, most students find that their fears quickly subside after a few jumps and that instead of being scary – it becomes exciting, addictive and appealing on many different levels. With skydiving the old saying ‘there is nothing to fear but fear itself’ has some merit. The fact is people wouldn’t continue to skydive and take it up as their main pastime and hobby if it was that scary. It’s perfectly normal to feel apprehensive about skydiving even if you are considering learning. You will almost certainly have not been exposed to anything like it in your life and like anything completely new, the idea will of course feel strange. It’s normal to be scared or to have apprehension of something so completely alien to you, but don’t worry, you will probably get used to skydiving very quickly! Many people become so used to skydiving that leaving the plane feels completely normal to them. If you feel nervous, practically everyone you speak to in skydiving will know what you’re going through and sympathise with you. People skydive for a number of different reasons but by and large most skydivers are just regular people. Skydivers come from a wide variety of different backgrounds and have a number of different ‘day jobs’. Many skydivers are professional people with highly responsible vocations, many are parents and grandparents. Although there is a risk associatiated with any sport like skydiving that risk is often a lot less than the public believes it to be. Many skydivers make thousands of jumps without so much as a twisted ankle, because of training and equipment. Skydivers are people who by definition are comfortable actively manage risks through knowledge and careful equipment decisions. If skydivers were all inherently risk takers they wouldn’t wear sophisticated parachute equipment and undergo extensive training. Skydiving is a beautiful exhilarating sport for people who want to experience something that most people do not, who feel comfortable managing risks and taking charge of their own destiny. People choose to skydive for many different reasons. Certain aspects of the skydiving, such as the feeling of free fall, are universally appealing to participants, but ultimately the reason why people skydive tends to be quite personal. Some people try skydiving as a new experience or casual activity, while others vigorously pursue skydiving as a sport. Skydivers experience things that others miss – the view of the earth from 2 miles up and the sensation flying though the air. Skydiving is visually stunning. Flying in formation with friends you’ve formed an hour before, the plane disappearing above you, the thrill of the parachute ride, the smile that just stepping out of a plane puts across your face – all are reasons to skydive. The “scene” is extremely friendly, it is an incredibly social sport and a great way to meet interesting people. For some, the perception of risk is a buzz in itself. Many people sum it up by saying “it’s the best fun you can have with your clothes on”. Ultimately, there is something magical about skydiving. Skydiving is a sport with a number of different progression paths from the moment you are qualified, you can be assured that there will always be something to keep you interested and new skills to learn. What’s the difference between a skydive and a parachute jump? The terms skydive, parachute jump and just ‘jump’ are often used interchangeably with each other although there are some subtle differences between some of the terms. 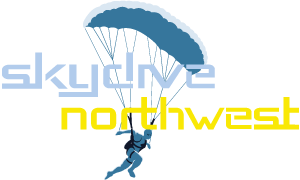 Skydives are by definition parachute jumps, that is because at the end of each skydive a parachute is used to land back on earth. However, where someone leaves an aircraft and immediately deploys their parachute without any freefall, it’s debatable whether that is technically a skydive but it’s definately a parachute jump. In any case, there is no need to get strung up over terminology everyone at a dropzone (what skydivers call a skydiving centre) will understand what you mean if you use either term. What actually is a skydive? A skydive is the name given to the act of leaving an aircraft at altitude and falling for a short while before opening a parachute and returning to earth. That falling or “freefall” as it’s known is what defines a skydive. Skydiving is a popular sport enjoyed by hundreds of thousands of people around the world. A qualified skydiver can develop their skills to skydive with other people for fun, or competitively using a number of different flying techniques.